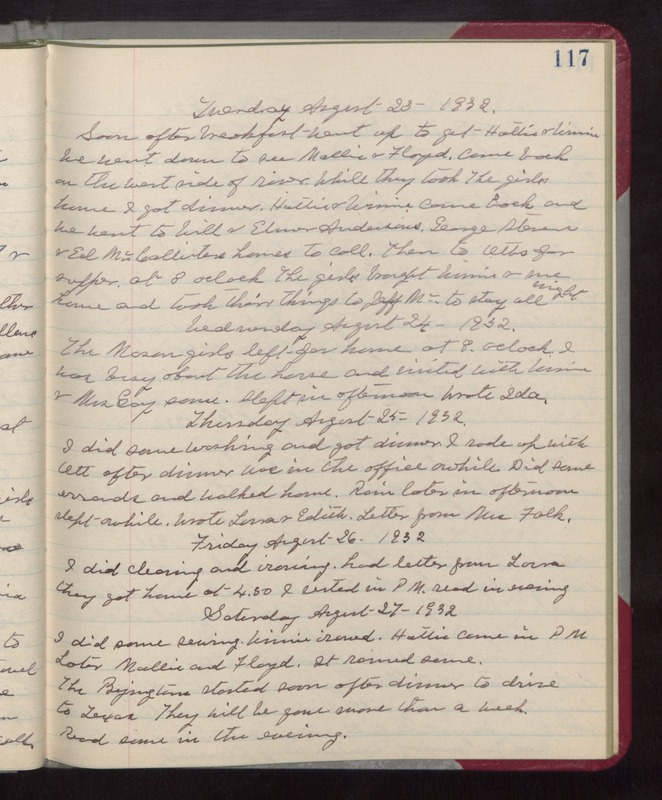 Tuesday August 23- 1932. Soon after breakfast went up to get Hattie & Winnie We went down to see Mollie & Floyd. Came back on the west side of river. While they took The girls home I got dinner. Hattie & Winnie came back and we went to Will & Elmer Andersons, George Stevens & Ed McCallisters homes to call. Then to Otts for supper, at 8 oclock The girls brought Winnie & me home and took their things to Jeff Mc. to stay all night Wednesday August 24- 1932. The Mason girls left for home at 8. oclock. I was busy about the house and visited with Winne & Mrs Gay some. Slept in the afternoon Wrote Ida. Thursday August 25- 1932. I did some washing and got dinner. I rode up with Ott after dinner was in the office awhile. Did some errands and walked home. Rain later in afternoon slept awhile. Wrote Laura & Edith. Letter from Miss Falk. Friday August 26- 1932 I did cleaning and ironing. had letter from Laura they got home at 4.30 I rested in PM. read in evening Saturday August 27- 1932 I did some sewing. Winnie ironed. Hattie came in PM Later Mollie and Floyd. It rained some. The Byingtons started soon after dinner to drive to Texas They will be gone more than a week. Read some in the evening.